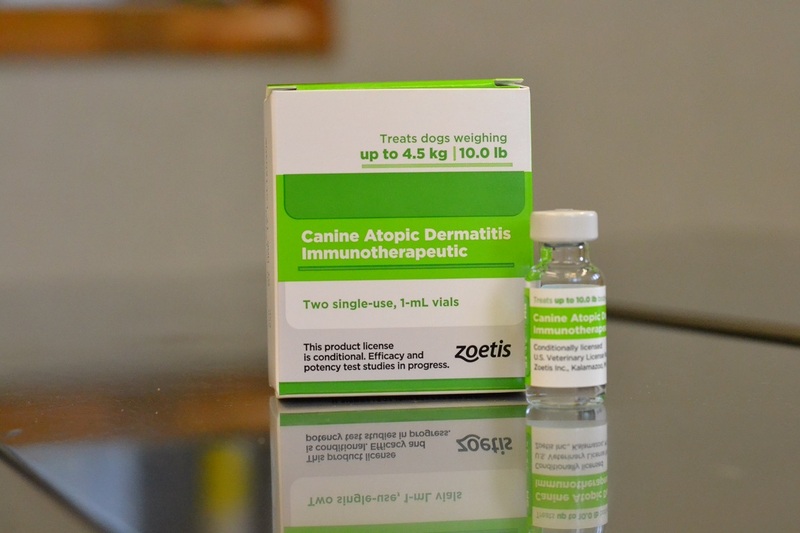 Cytopoint, formerly known as Canine Atopic Dermatitis Immunotherapeutic (CADI), is an injectable treatment for canine atopic dermatitis, or skin allergies due to pollen, mold, dust mites, and other environmental causes. It has recently been developed by Zoetis (formerly known as Pfizer). We at Evesham Veterinary Clinic are committed to bringing you this cutting edge technology. Cytopint is made possible by recent advances in monoclonal antibody production. Cytopoint is a caninized anti-cIL-31 monoclonal antibody (mAb) specifically designed to target interleukin (IL)-31, a key cytokine involved in sending the itch signal to the brain. It is more targeted than prednisone, Atopica, and Apoquel. Side effects have been rare, and it is safe for dogs of all ages and dogs on concurrent medications. A single injection lasts for up to two months. For more information or to schedule an appointment to see if your dog would benefit from this innovative new treatment, please call (856) 983-9440.